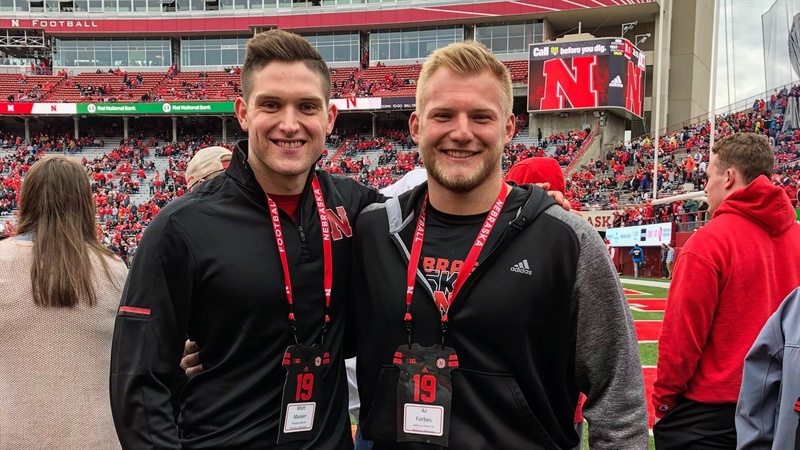 AJ Forbes (pictured at right) is a 2018 preferred walk-on offensive lineman commit from Bellevue West High School and the co-editor in chief of the Thunderbeat, Bellevue West's school newspaper. Forbes will be writing a series of guest posts for Hail Varsity throughout his freshman year, giving a glimpse into what the student-athlete experience is like at Nebraska. Ever since Coach Frost was hired as the next head coach at the University of Nebraska the energy around the state, as well as the entirety of Husker Nation, has been remarkable. As a recruit and Nebraska native, I can feel the excitement growing as we get closer to the season opener against Akron. All of this buzz was epitomized on Saturday during the spring game. After all of the walk-ons went through a meeting concerning housing and academics, we all went out to Tom Osborne Field a little over an hour before the game started. The Homegrown Huskers event in December was the first time in three years that I had set foot inside Memorial Stadium. At that moment, I knew I wanted to be a Husker, yet that experience yielded stands that were empty. The chills that I had walking out to almost 87,000 people on Saturday were no comparison to the ones I had in December. All of the recruits on the sideline had the privilege of experiencing a front-row view of the best entrance in college football: the Tunnel Walk. When I saw my future teammates run onto that field while the stadium vibrated around me, I wanted to put the pads on right then and there. My eagerness to get on campus and get to work only grew and it continues to grow as my report date continues to come closer. In terms of watching the game itself, I treated it like a film session. I would look at the different formations, how they would run certain plays, how the offensive line pass-protected against a certain front, and so on. I did this throughout the whole game with fellow walk-ons Matt Masker and Collin Shefke. We weren’t watching as fans — we were watching as guys that were ready to get on the field. My biggest takeaway from the game is that the new Nebraska offense is similar to what I ran at Bellevue West. There were very few times when the ball was snapped with less than 15 seconds on the clock, which is the pace that I had grown accustomed to in high school. Having an emphasis on the option run game was just as refreshing. The fact that I was surrounded by so many of the Cornhusker faithful only enhanced the experience. My family and I left Lincoln with more excitement than ever. We got a taste of what Nebraska football is going to look like and we couldn’t have been happier. I missed being in Memorial Stadium with the best fans in college football and now I will have the opportunity to don the scarlet and cream. Call it a cliché, but there is truly no place like Nebraska.